Iran's Culture Minister, Ali Jannati, has said that social networks should be made accessible to ordinary Iranians. Mr Jannati was quoted by the Irna state news agency as singling Facebook out for special mention, saying it should be available for everyone. Such sites were blocked in 2009, when millions protested against the result of a disputed presidential election. But senior officials, including Foreign Minister Mohammad Javad Zarif, have begun to use them extensively. Ordinary Iranians are forced to use virtual private networks (VPNs) if they want to bypass the restrictions. In September, social networks were unblocked for a day, but officials blamed this on a technical error. The government of President Hassan Rouhani reportedly does not have the sole authority to end the restrictions, which Mr Jannati said were overseen by the "Filtering Committee". "We need to talk to all the people in that committee, because not only Facebook, but also other social networks have to be accessible, and there should be no legal constraints to access them," he was quoted as saying by the Isna news agency. The minister noted that filtering could "not stop people from accessing information", citing the failure of the Iranian authorities' jamming of foreign satellite channels and banning of satellite dishes. 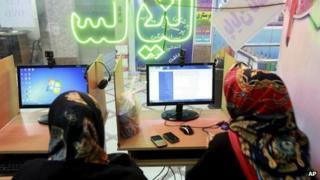 Will Iran loosen its grip on the internet?